Meet Josie Wolfe SkillsUSA’s 2017-2018 National College/Postsecondary President! This is Josie’s 6th year participating in SkillsUSA. Her journey began in Maryland at the Center for Applied Technology North as a culinary arts student and SkillsUSA member. Josie has competed a total of seven times earning seven medals in Commercial Baking, including a Bronze Medal at the 2015 National Skills and Leadership Conference. In addition to her Bronze Medal, Josie also earned a scholarship to Johnson & Wales University. As a Johnson & Wales University student, Josie became a SkillsUSA RI State Officer in 2015. Josie competed in the 2017 SkillsUSA RI State Champions, and won a bronze medal in commercial baking. However, Josie’s journey was not complete. She travelled to the 2017 National Skills and Leadership Conference with Team RI as a National Officer candidate. 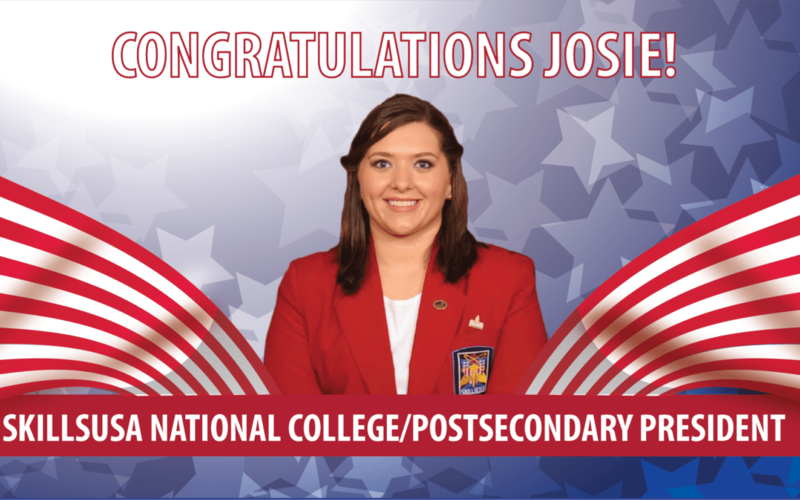 Through Josie’s hard work, dedication, and contagious optimism she was elected SkillsUSA’s 2017-2018 National College/Postsecondary President. Josie will graduate from JWU in the spring and then intern at her alma mater, Center for Applied Technology North in the fall of 2018.